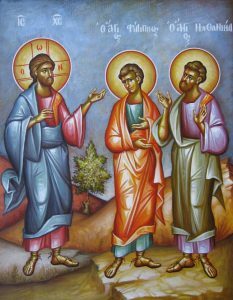 “We believe that at the Transfiguration He manifested not some other sort of light, but only that which was concealed beneath His fleshly exterior. This Light was the Light of the Divine Nature, and as such, it was Uncreated and Divine. So also, in the teachings of the Fathers, Jesus Christ was transfigured on the Mount, not taking upon Himself something new nor being changed into something new, nor something which formerly He did not possess. Rather, it was to show His disciples that which He already was, opening their eyes and bringing them from blindness to sight. For do you not see that eyes that can perceive natural things would be blind to this Light? “At once he appears like a flash of lightning. Do my words seem blasphemous? the one who is opening to you so deeply. 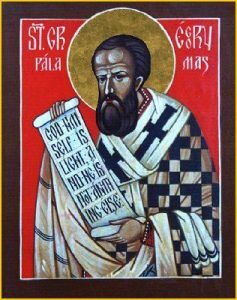 During Great Lent the Liturgy of Saint Basil the Great is prayed at Divine Liturgy and not the Liturgy of Saint John Chrysostom. 1. Sorokousty: will be celebrated during Lent on All Souls’ Saturdays, March 18, April 1, June 3. Please take a book found in the entrance of the church, fill it out. Place it in envelope, and drop it in the collection basket. Let us remember all our loved ones who have gone to their heavenly reward. Eternal Memory! 2. Lenten Parish Mission: On Sunday, March 19 and April 9 , we will have Father Robert Markovitch giving a Mission in our parish. I would like to see all of our parishioners participate in this Mission in order to prepare themselves spiritually for the upcoming Resurrection of our Lord Jesus Christ. 3. 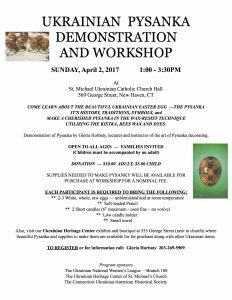 Pysanka —Ukrainian Easter Egg Workshop —will be held on Sunday, April 2, 2017 in the church hall from 1:00 to 3:30 p.m. It is open to youth and adults, but children must be accompanied by an adult. Bring your children and grandchildren to learn their heritage. Free to parish youth and Ridna Shkola students. See flyer for details or call Gloria Horbaty (203)269-5909 for information. Sponsored by: UNWLA, Branch 108, the Heritage Center and the CT Ukrainian American Historical Society. 4. The Ukrainian National Association, Branch 414, New Haven, will hold their 14th Annual EASTER EGG HUNT on Palm Sunday, April 9, 2017 at 12 noon on the church grounds. For information contact Gloria Horbaty at (203)269-5909. 5. The next meeting of the Ukrainian American Veterans, Bishop John Stock Post 33 of New Haven will be held on Sunday, March 19, 2017. We will begin the meeting immediately after the second Divine Liturgy. The meeting ill be held in Classroom 2. For more information, contact the Post Commander Carl Harvey at (203) 389-6076 or crharv3841@optimum.net. 6. Our next Pyrohy Saturday will be on Saturday, March 18, 2017. We need your help also on Friday 17 to peel potatoes. Please come and help. See Walter Ushchak for more information. 7. Sales: cabbage with sausage for $10.00 per container, stew with meat and mushrooms for $8.00, pierogies in bags for $12.00 or in container for $5.00. 8. SUMA Federal Credit Union, New Haven Branch, 555 George St., New Haven, CT. Business hours: Tuesdays from 3:00 to 7:00 p.m., AND Saturdays, 9:00 a.m. to 12:30 p.m. Phone: (203) 785-8805; Fax: (203) 785-8677. 9. Mercy for the Needy: A container is in our church vestibule for non-perishable food. This collection will be taken every week. Father Iura will distribute the food to those in need. Thank you for your generosity. See Judy Ellis for more information. 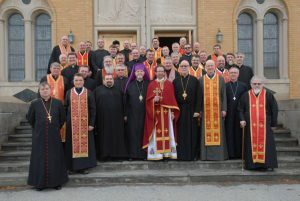 The Liturgy of the Pre-Sanctified Gifts is on Friday evening at 7:00 p.m.
During the first week of the Great Fast clergy of the Stamford Eparchy attended their annual clergy retreat at Mt. Alvernia Retreat Center in Wappingers Falls, NY. This year’s retreat master was Father Ihor Boyko, S.T.D., Rector of Holy Spirit Seminary in Lviv, Ukraine. 1. The Knights of Columbus Blessed Andrey Sheptysky will hold its next regular meeting on Monday, March 6, 2017 at 7:00 p.m. in the church hall. All men of parish are invited to attend to see what the Knights are all about and what can do for our parish. 2. The next meeting of the Ukrainian American Veterans, Bishop John Stock Post 33 of New Haven will be held on Sunday, March 19, 2017. We will begin the meeting immediately after the second Divine Liturgy. The meeting ill be held in Classroom 2. For more information, contact the Post Commander at (203) 389-6076 or email: crharv3841@optimum.net. 3. SOROKOUSTY: will be celebrated during Lent on All Souls’ Saturdays, March 11, 18, April 1, June 3. Please ask Father Iura for a booklet for the names of the deceased, fill it out. Place it in envelope, and drop it in the collection basket. Let us remember all our loved ones who have gone to their heavenly reward. Eternal Memory! 4. The Vigil Light: This week vigil light is offered by Dionizia Brochinsky in memory of +Alice Brochinsky. 5. All new announcements for upcoming events should be submitted to rectory office before Tuesday of the week prior to when the event is to be posted in the bulletin. How, then, should we keep the Fast? Hebrews tells us: “since we are surrounded by so great a cloud of witnesses, let us rid ourselves of every burden and sin that clings to us and persevere in running the race that lies before us while keeping our eyes fixed on Jesus, the leader and perfecter of faith. (Hebrews 12:1-2)” The Sunday of Orthodoxy helps us to fulfill this plan, for “keeping our eyes fixed on Jesus,” gazing upon his image, we are led to God, to faith, to life. Father Iura cancelled the Liturgy of the Pre-Sanctified for Friday, March 3, 2017.